To the left is the front page of yesterday’s New York Newsday. 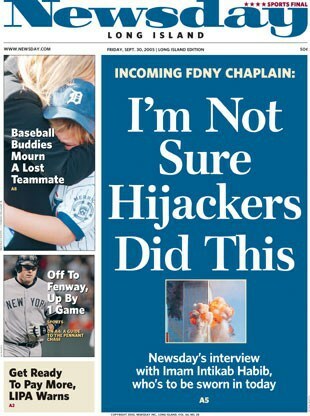 The picture below the main headline (“I’m Not Sure Hijackers Did This”) shows the second World Trade Center tower being hit on the morning of September 11th, 2001. Intikab Habib, a Muslim imam, was due to take an oath Friday morning as a new chaplain with the Fire Department of New York City. Just a few hours after Newsday published Habib’s statements doubting the official story of the 9/11 attacks, he was forced instead to resign the appointment. The Fire Department first learned about Habib’s 9/11 skepticism from the Newsday story. “We don’t ask new employees about their political views before we hire them,” a Fire Department spokesperson told Newsday. Two weeks ago, Habib, who is originally from Guyana, participated in several Fire Department memorials observing the fourth September 11th anniversary. He did not bring up his views about the origins of the 9/11 events at that time, according to Newsday staff writer Carol Eisenberg. The pressure apparently applied to force Habib’s immediate resignation thus came in direct reaction to the publicizing of his political views. We note simply that Habib’s comments were not moral in nature. He raised doubts about the facts of the US government’s 9/11 story. The issue therefore is not whether he offended anyone by answering Newsday‘s questions, but whether there is a factual basis to his skepticism. Will the Fire Department ask future candidates for chaplain to first declare their views on who was really responsible for the September 11th attacks? Will belief in the official story, with all of its omissions and absurdities, become a requirement for service in government? Friday’s web version of the Habib interview included the entire text of the original print-edition article by Eisenberg, adding the news of Habib’s sudden resignation and an approving comment by Bloomberg. And their fellow Newsday staff writer Patricia Hurtado provides a brief look at 9/11 skepticism that mentions both 911Truth.org and this author.